At Hill and Hill, we have been supplying stylish and comfortable living room nursing home furniture to care homes across the UK for over a decade. A living room is the centre of a home, it is a space where people relax, where they socialise and where they should feel the most comfortable. For these reasons, we have carefully designed our nursing home furniture to ensure that it is durable and practical whilst also being stylish and comfortable. At Hill and Hill, we aim to make your nursing home, a real home. We supply everything from TV cabinets, coffee tables and display cabinets to stylish arm chairs and recliners and decorative items such as ornaments, mirrors and flowers. Whatever style you desire, we guarantee to have something your residents will love. Our dementia range has proven to be particularly popular and we pride ourselves on supplying homely living room furniture which is both elegant and stylish whilst also being practical. 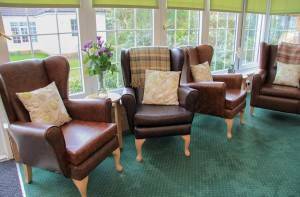 Our dementia nursing home furniture is designed so that possessions can be seen and easily reached so that your residents feel as comfortable as possible in their home, our Reminiscence Lounge Furniture demonstrates this perfectly. As we focus on supplying practical, stylish and comfortable nursing home furniture, all of our living room seating options are also available in waterproof fabrics and they also come with memory foam cushions. Our nursing home furniture is also available in a range of styles and colours to help you make your nursing home unique. At Hill and Hill, we offer great deals on our living room nursing home furniture, soft furnishings, pictures and flowers. Our main priority is helping you make your nursing home as comfortable, safe and homey as possible. With Hill and Hill, you can be confident that you are buying from a trusted supplier who understands what your residents need. If you would like more information or have any question about our living room nursing home furniture, please get in touch with us today.